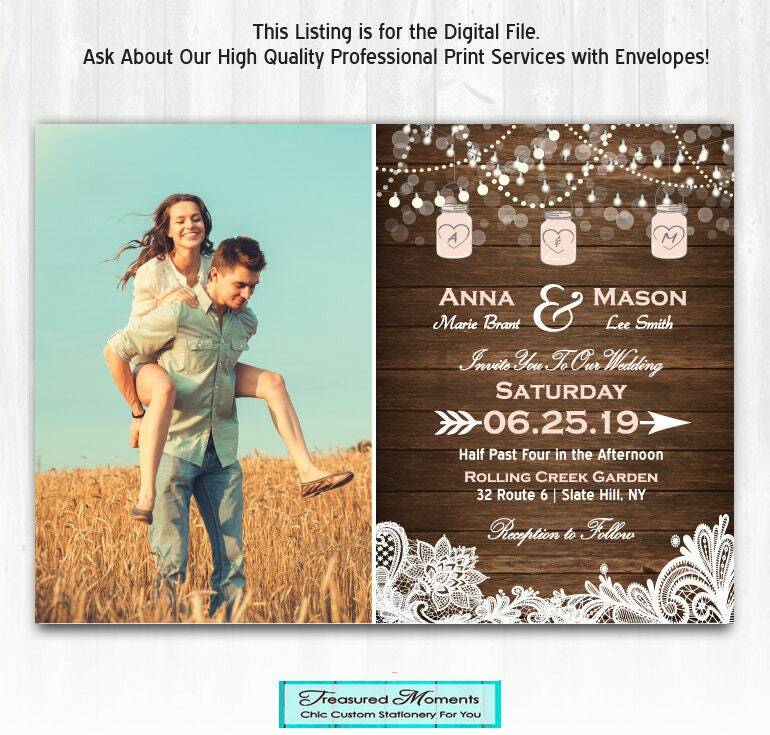 This Lace Wedding Invitation with String Lights and Mason Jars will be personalized with your choice of wording and emailed to you for you to print at the printer of your choice. 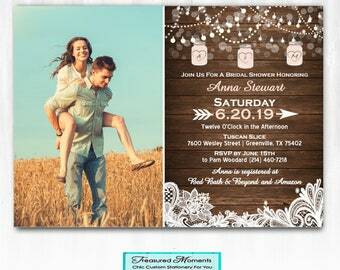 This listing is for a print ready DIGITAL FILE ONLY of this Lace Wedding Invitation (JPG or PDF). If you want colors, fonts or placement DIFFERENT than shown in the examples contact me. If the changes are minor there will be no charge. For major changes there will be a small redesign fee. There are several color choices in the above photos. Please specify color choice in the Notes to Seller. Contact me for information & pricing on other matching items. SUPER FAST TURNAROUND! This is my full time job so I answer emails and convos within hours if not minutes! Digital Proofs are sent within 36 hours, usually sooner, even on weekends! 3. E-MAIL 'TreasuredMomentsCard@gmail.com' with your 300 dpi, high resolution photo/s (if design includes photos). Visit my Policies page: http://www.etsy.com/shop/TreasuredMomentsCards/policy for shop policies. By purchasing my listing, you agree to the terms listed above and in the shop policies page. Designs in the shop are copyrighted © by Treasured Moments Cards 2008-2016.